If you searching for metal relics or old coins strike your curiosity, then picking up the metal detectors can be a fun endeavor. Not only can they pay off if you find something valuable, it can be therapeutic or relaxing just searching for metal. The first thing that you will have to consider is your budget. There are many types of metal detectors at a variety of prices, from budget all-around models to high-end models specializing in gold hunting or underwater models. Generally, more expensive metal detectors will offer greater detection depth, as well as other desirable features. One feature that may catch your eye are modes that discriminate between different kinds of metals, so you can ignore certain metals. After the price, having a durable, reliable, easy to use design are the next most important factors. The Gold Digger by Bounty Hunter is a good first step into for general purpose metal detecting around the yard, beach or park. It is reliable and fairly inexpensive. Its motion, all-metal mode, and trash elimination mode control allow you to just find the treasure you are seeking. It includes earphones with a headphone jack so you can privately search on streets or crowded beaches. It requires 2 9V alkaline batteries. The Bounty Hunter Time Ranger is a cool modern take on metal detectors aimed at professional treasure hunters. This unit is fully submersible and has an 8 inch Bounty D-Tech search coil with interchangeable coils. It also features Ground Trac technology which automatically balances the machine to the surrounding soil conditions. With its versatile LCD readout screen and touch-pad control, it is intuitive to use. The screen shows information such as the target ID, sensitivity level, ground balance monitor, and iron level discrimination. The touchpad is fully customizable and you can even manually set the ground balance. For kids that are developing an interest in treasure hunting, the BHJS Junior by Bounty Hunter is a good choice. This child-sized metal detector can detect small coin-sized objects up to 5 inches deep, and larger metal objects up to 3 feet deep. The target indicator meter shows signal strength, and the signal becomes louder as you get closer. This lightweight, ergonomic design is easy to use even for beginners. The Bounty Hunter TK4 Tracker IV is an inexpensive specialized option for detecting metal objects in extreme ground conditions. It is built rugged with its waterproof open coil and stem and comes with several vital modes. It has a motion all-metal mode, discrimination mode, and 2-tone audio mode. The present ground balance setting neutralizes responses to mineral content in the ground, and the disc control can distinguish between target metals and unwanted ones. The Ace series by Garrett offers options for higher-end metal detectors. The 250 series offers a large scan area of up to 10″ with a rapid level of precision. It features an electronic pinpoint feature with coin depth gauge, and a high powered 6.5 x 9″ ACE Coil. This allows it to retrieve its target much quicker than other metal detectors. With its pinpointing technology, custom notch discrimination, and adjustable sensitivity/depth settings, it has all the features you will need. It also comes with a headphone jack to listen to the audio tones, and the control panel is intuitive. For similar performance as the Ace 250, but at a reduced price, the Ace 150 by Garrett delivers. 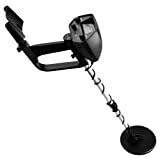 This lightweight, durable metal detector has all the same great features as the 250 series. Its stem is adjustable between 42″ and 51″, and comes with a headphone jack with a clear tone speaker. It uses four AA batteries, and you can even disassemble it into 3 separate pieces for storage. If you’re looking for something more for advanced users, the SS2 Sharpshooter II by Bounty Hunter is where you will want to be. It has the same high-quality of other Bounty Hunter products but performs even better. It can detect underwater with its waterproof disc/stem or up to 5 feet of earth. The LCD readout shows the target ID, depth readout, battery level indicator, and controls for the four modes of operation. This unit also contains Ground Trac technology, which auto balances the machines to the current soil condition. 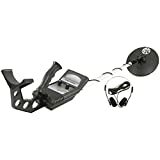 This lightweight, easy to use metal detector has an excellent recovery rate and even has a comprehensive online tutorial. The Winbest Pro Edition by Barska is another solid general purpose metal detector for amateur treasure hunters and hobbyists. It features two operation modes for custom detection of different metals. Its all-metal mode searches for different types of metal with its auto ground balance and high sensitivity detection. The disc mode searches by discriminating on certain metals so you find what you want. The stem is adjustable between 15.5″ and 25″. You can even submerge the search coil in shallow water up to 6.5 inches in depth. It comes with an adjustable armrest and headphone jack for added convenience. For kids interested in picking up this hobby, the Ground EFX MC1 is a safe, cheap and effective metal detector. This model is designed specifically to withstand the rigors of child use; its stem is adjustable between a modest 26″ to 36″ which is easy to wield for kids. It can detect coins up to 5″ deep, or larger metals up to 24″ deep. Its 6.5″ coil can be submerged under water up to 24″ in depth. This is a great gift for any kid to teach them about history, science or just instill a sense of discovery, as well as get them more active outside. The Bounty Hunter QSIGWP is a great modern take on a metal detector that emphasizes ease-of-use. It detects up to 8″ for coin-size objects and up to 3′ for larger metal objects. It has a fully automatic ground balance and squelch-tech that reduces false signals. With its one-touch discrimination mode and depth control, it is very intuitive to use. It features a digital target ID display and a 3-tone audio cue for detection feedback. Even better, the LCD screen is easy to read for people of any metals.